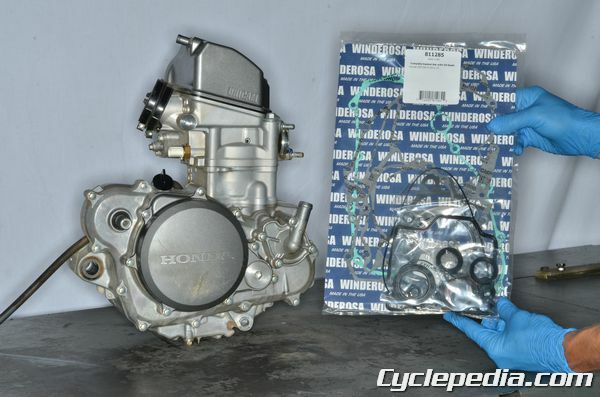 Servicing and repairing power sport vehicles require replacing gaskets and seals on a regular basis. Trying to reuse seals and gaskets can leave a technician in a world of hurt and waste time redoing work. Always be prepared to replace any seals and gaskets that are removed during a service or repair procedure. 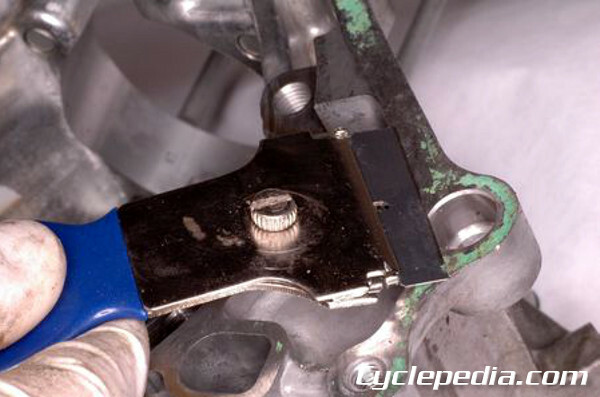 Don’t accelerate the wear of that new component because it is installed with an old seal. Nobody likes to order parts over and over to complete a job. Take a look through the repair manual and identify the seals and gaskets associated with the areas of service before diving into a procedure. Don’t get focused on the hard parts and forget the gaskets and O-rings. Get all of the gaskets and seals ahead of time so that $3 oil seal is on hand when needed and doesn’t require another trip to the parts counter or week of waiting on the mail. Looking through parts diagrams trying to find all the needed seals and gaskets can be frustrating on small jobs. If you are doing an engine overhaul or major service it is even worse. The best course of action is to get a gasket set. Many OEMs and aftermarket companies offer gasket sets with all gaskets, gaskets and seals, top-end only gasket kits, or component specific gasket and seal kits. Ordering the correct gasket set with one part number not only is quicker, but it reduces the chance of ending up with two dust seals in place of the dust seal and oil see that are needed. When using gasket kits take note of position and orientation of the original seals. The contents of a gasket kit may not be labeled with individual part numbers so it is up to the technician to identify the correct components, and many oil seals and O-rings can be hard to differentiate. Also, not all gasket and seal kits include crush washers. These items may need to be sourced independently. 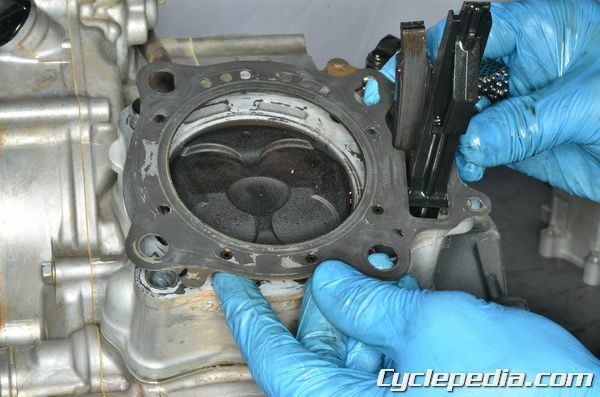 Cylinder base gaskets and cylinder head gaskets can be difficult to identify the correct orientation. Some can be installed upside down while visually looking correct. This can result in a poor seal. Follow the service manual’s instructions to identify markings or construction features of the gasket to insure correct placement. Avoid ruining new oil seals on sharp edges or threads. Use tape or plastic wrap to cover sharp shaft features to prevent seal damage when the shaft enters the seal. Also, do not allow oil seals to roll up or push out when installing a shaft into the seal. When installing oil seals lubricate the lips of the seal with oil or grease along with the shaft or boss that fits into the oil seal. The oil seal needs a minimal fluid film between its lips and the turning shaft to maintain a good seal and to dissipate heat. 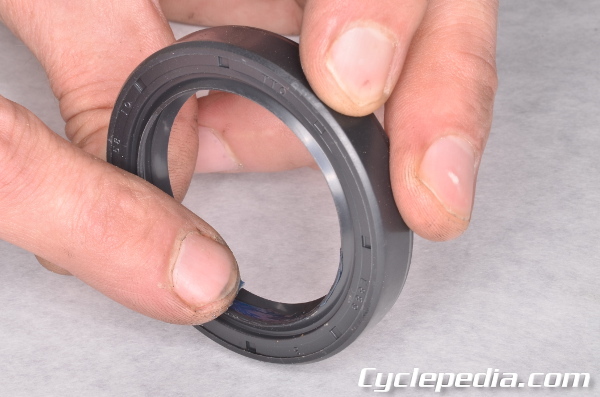 An oil seal installed dry may not seal at all, and will most likely fail prematurely. 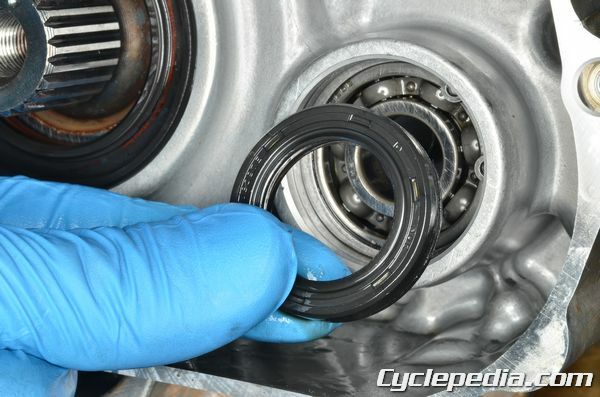 O-rings should be treated in the same manner and not installed dry unless otherwise specified by the service manual. Thoroughly clean mating surfaces prior to installing new seals, gaskets, or sealant. Follow the manufactures instructions carefully if a chemical gasket remover product is used as these are some of the nastiest chemicals in the shop. 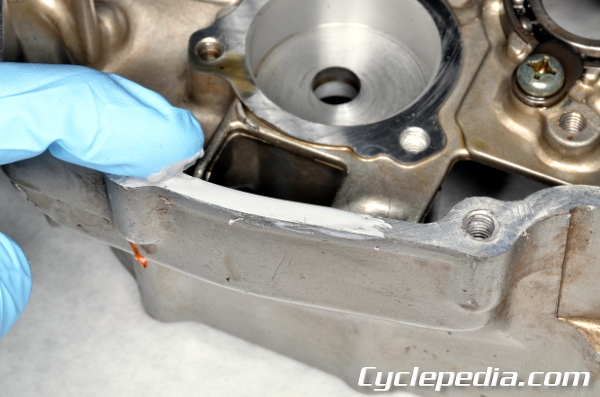 Do not nick or gouge the mating surface when attempting to remove old gasket material. If the mating surface is nicked up or burred it should be smoothed out with an oil stone. If the damage is severe the mating components must be replaced. When using a liquid gasket sealant have the correct type for the application as required by OEM. Sealants vary by temperature rating, chemical resistance, drying time, and hardening performance. Apply the sealant to the mating surfaces evenly in a thin coat. Do not be excessive as the extra sealant will be pushed out when the components are joined and may enter oil passages or bearings. Also, only apply sealant along with a seal or gaskets when specifically called out by the service manual. Have everything 100% ready to go together when the sealant is applied. The mating surfaces must be joined in a timely manner or the sealant will dry prematurely and will not seal correctly.